Goat anti Human 3-beta-HSD1 / HSD3B1. 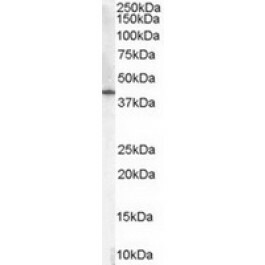 Western Blot: 0.01 - 0.1 µg/ml. HSD3B1 (3-beta hydroxysteroid dehydrogenase) is a bifunctional enzyme that catalyzes the oxidative conversion of Delta(5)-ene-3-beta-hydroxy steroid and the oxidative conversion of ketosteroids. The 3-beta-HSD enzymatic system plays a crucial role in the biosynthesis of all classes of hormonal steroids. There are two HSD3B1 proteins, type I and type II. Expressed by different genes, they function in different areas of the body. HSD3B1 has been shown to be a highly specific and sensitive trophoblast-associated marker (Mao et. al). Chang BL, Zheng SL, Hawkins GA, Isaacs SD, Wiley KE, Turner A, et al. Joint effect of HSD3B1 and HSD3B2 genes is associated with hereditary and sporadic prostate cancer susceptibility. Cancer Res. 2002 Mar 15;62(6):1784-9. PubMed PMID: 11912155. This antibody reacts to HSD3B1.